We’re still not- so- patiently waiting for TA to travel for our Vivienne. It has been 255 days since we first saw her face, and not one of those days has gone by that I have not thought of her, prayed for her. We hope to travel before the end of the year, before Christmas. Just the thought of seeing her, of holding her… fills me with happiness. With anticipation. With joy. I am so so excited. She will turn 2 on November 1. And she is firmly entrenched in life surrounded by a foster family… a wonderful foster family. And while we are counting the days to her, she is most definitely not counting to days to us. She has no idea what lies ahead for her, how her life will be turned upside down. How she will have to say goodbye to the only mama she has ever known. How she will have to leave her homeland, the traditions, the customs, the people who look so reassuringly familiar. I don’t know everything about adoption, that’s for sure. But I know enough to know there is no way to completely prepare for what lies ahead for Vivi and me on that day we meet in the Civil Affairs office. I know enough to know that no matter how well her foster mother prepares her (and I pray she does!) that Vivi will be terrified. I know enough to know that adoption is inherently filled with sadness and loss. And that even though we know Vivi is going to be loved, cherished and part of our family forever, she doesn’t know that. But I also know enough to know that there is One who is capable of filling all voids and healing all wounds. One who can bridge that expansive distance between where we will be on that day we meet and where we will be one day, some day, in the future. And I look to Him for all those things on that day in Civil Affairs. And every day after that. i think you are already doing the best things you can do…praying for yourself and miss vivi and reaching out for the prayers of others. rest assured we will all lift all 9 of you up as the day approaches, and every day afterwards. what a terrifying, thrilling, amazing adventure. and what a blessing. I have no advice – never been to China, never adopted *yet* – but I have learned so much from you. No doubt you will do just fine by yourself and so many of us will be praying for you ! We will probably be in China in Dec. too getting our Maggie – Hope to see ya'll there ! Stefanie, being the strong, awesome mom that you are, I know you will do fabulously!! You know you have ALL of your prayer warriors here, lifting you all up too! Big HUGS & prayers, always! I love this post! And I love that the One you're looking to (we're looking to) can do all these things for an infinite number of His children at the same time, because I'll be looking to Him for the SAME things at about the same time you will!!!!!! Praying for a fast TA for you! Amen, Stefanie. God is already working on her little heart, preparing her for what lies ahead. And He's working on yours too! I will continue to pray for all of you. And my advice on your trip? I so wish you didn't have to go alone. You are a BRAVE, strong Momma and I'm sure you will do GREAT. But I'm sure a travel partner would make you breathe a little easier. Praying all goes as smoothly as possible. What a beautiful post. Thank you for sharing it. It's just the perspective I needed today, after reading up on some stuff going on here and in the larger adoption community. At the other end of this journey waits a little one for whom everything will change soon. My prayers are with you, little Vivi, and her foster parents. No advice, just lots and lots of love and prayers for you all. I so admire you! I can't fathom going alone. And I know you've done it before…with Sophie, right? I'm wondering if there isn't some bloggy friend out there who'd be willing to pay for their own flight and food just to tag along and be extra hands and feet and photographer. Seriously. Praying for the Lord to go before you and make your path smooth. Sweet sweet girl. It is so tough knowing how their worlds change in an instant and how they can't fathom yet how good it will be. But you know and that counts for so much. It isn't just about you and your joy. It is also about her and her grief and the grief you have too because of your love for this daughter of yours, woven into the fabric of your heart even before she is in your arms. That brought tears to my eyes. We are hoping to bring our little toddler home very soon, too. It is our first adoption. Thanks for the words right out of my heart. I think the fact that we are aware that they will be going through this and we are prepared with prayer to love them through this will speak volumes. I am scared too – and I now feel okay b/c if YOU, The most incredible adventure adoption mama is scared then I guess it is okay. :)! You are going to do GREAT! Stefanie, I have been reading your blog for months, but have not been compelled to comment until now. That was so touching. We are beginning the process of adopting a waiting child in China to join our family of 5 boys and I have all those fears and all the anxiousness you talked so gracefully about. Your post made me cry….for your sweet Vivi and the fear and uncertainty she will face….but also for the wonder and joy she will soon know by being a part of your family. What a blessing you and your husband are. Thank you for your honesty and humility as you do God's work. I'll go with you so you don't have to go alone 🙂 (as long as I'm healed enough by then) Would that help? Will you be traveling with a "group?" Oh Stef!! If we travel together, I will be there for you!! You will do it because that is what you do, you are a momma…..God Bless! This is such a beautifully written post; very powerful. No advice Stefanie, just lots of prayers. I have a feeling Miss Vivi will attach to her Momma quickly!! Stef…what a beautiful and heart wrenching post. You know the drill but I imagine it never gets easier. I know you will take each day as it comes and just be there to love her every step of the way. An amazing life awaits her here with her special family and in time, she will realize just how very precious those family ties are. I wish you peace as you wait to hear. She is getting so big…..can't wait to see her in your arms, honey! Hi, I've been reading your blog for a while now, and feel compelled to comment on this post. You see, I'm the "other mama". I live in a southeast Asian country doing foster care for kids that will be adopted internationally. I've been mama to two darling girls- one left in January of this year. I had her from 2 months old and she was almost 2 years old when she left. I'm still fostering another litle girl-got her when she was 4 months old and now she is 3. These kids became (and still are) unspeakably dear to me and I know from first hand experience how tough the transition is when their family comes to take them home. Thankfully, we get to have several transition days, when the adoptive family stays in our neighborhood and spends lots of time with us before they take their new child. All that to say, Thank-you for acknowledging that the change will be hard for your new daughter and that she is not "eager to meet you" (can't remember exactly how you said that). She does need you- she just won't want you right away! But give her time, lots of sensitive love and care (I know you will), allow her to grieve, and she'll love you for it! God's best to you! I'm so excited to follow your journey to China and observe the miracle of adoption in your family! Well,I even think you are already do your best. So, even from germany my prayers are with you. What a beautiful post. I don't know what it will be like to bring home a toddler. But, I do know God will equip you with what you need to meet her where she is at! I will be praying that God is preparing her now for this time. Stef, you have so much love to give Vivi. I just know that she will sense that and that she will love you back with her sweet little heart too! I will be praying you through your journey friend! Great post…thanks for sharing your heart…once again! You definitely have the right attitude…. 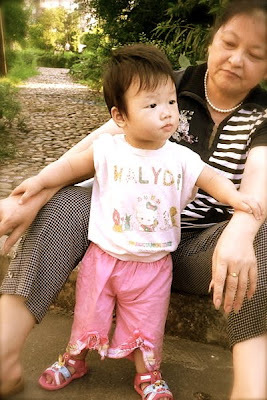 When we adopted our 4 1/2 year old from China, she was 26 months old. I could tell she was greatly loved by her foster mama…oh, did this child grieve…but, within several days she began calling me mama…her grieving lasted for many months…yet, during this time, she looked to me for comfort. How bittersweet those months were…. you summed this up so well stef and it brought back all these vivid memories of our first moments than days with M-n-M. this brought me to tears, remembering her anguish and mourning and how horribly exhausted i felt and yet- we just pushed through, kept giving and giving, even when our hearts were depleted- and look where we are now, such a short time later. i am praying for her and for each of you. that you are able to meet her grief with wide open arms and see her through to all those best smiles and giggles that are coming not long after. I can imagine how scary it is to think about it before you get your sweet Vivi. I always think the long wait makes it very easy to worry about things. We just adopted Samantha at 3 years and 5 mos. and yes we are still transitioning but I must tell you, it has gone better than we ever imagined. I am sending prayers your way that Vivi's transition is smooth. I know you are an awesome mama and will do everything you can to make her transition easier. As I am tearing at reading your eloquent words, my heart reaches to you, your family and especially to little Vivi. I think you are a tremendous human being and that your heart is so BIG you put us all to shame. I am in awe by your heart, generosity, and love. I cannot wait to see you and Vivi together and though it will be hard for her at the beginning she will see and feel the love you already carry for her in your heart. May God bless you and yours truly. I don't have any advice for you, having never adopted, although it is certainly a dream of ours. I just had to tell you how much your post touched my heart. I am an adult KAD and it is so amazing to hear that you understand how much she is losing…as well as how much she is gaining. I think sometimes people lose sight of all that we have lost…and think we should not mourn that loss and only be grateful for what we have gained. I love my parents with every fiber of my being. They are to me, my REAL parents. Even if I found my bio. parents in Korea tomorrow, it would not change a thing. However, I do mourn the loss of my homeland and culture. I do mourn the fact that I am often viewed as an outsider by other Koreans. Thank you for acknowledging that. It means alot to this adoptee.